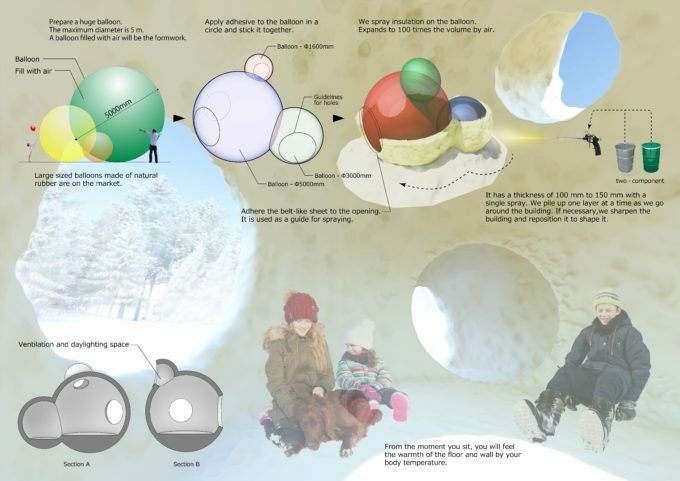 This building is “home prototype” which is thought to be low cost in extremely cold or hot areas. 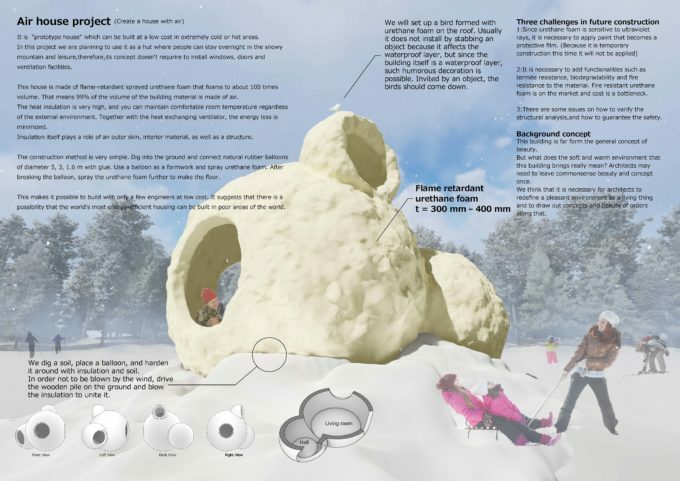 In this project we are planning to stay as a hut that will stay overnight at snowy mountain and leisure but we will not install windows, doors and ventilation facilities to present that concept. This hut is made of flame-retardant sprayed urethane foam that foams to about 100 times volume. That is, 99% of the volume of the building material is made of air. The heat insulation is very high, and you can maintain comfortable room temperature regardless of the external environment. Together with the heat exchanging ventilator, the energy loss is minimized. Insulation itself is an outer skin, interior material, it is a structure. The construction method is very simple. Dig into the ground and connect natural rubber balloons of diameter 5, 3, 1.6 m with glue. Use a balloon as a formwork and spray urethane foam. After breaking the balloon, spray the urethane foam further to make the floor. Construction is possible with only a few engineers and construction is possible in a short period at low cost. This suggests that there is a possibility that the world’s most energy-efficient housing will be built in poor areas of the world. It has a thickness of 100 mm to 150 mm with a single spray. We will stack one layer at a time as we go around the building. If necessary, sharpen the building and reposition it to shape it. We dig a soil, place a balloon, and harden it around with insulation and soil. In order not to be blown by the wind, drive the wooden pile on the ground and blow the insulation to unite it. We will prepare a huge balloon. The maximum diameter is 5ｍ. A balloon filled with air will be the formwork. Apply adhesive to the balloon in a circle and stick it. We will spray insulation on the balloon. Expands to 100 times the volume by air. Adhere the belt-like sheet to the opening. It is used as a guide for spraying. From the moment you sit, you should feel the warmth of the floor and wall by your body temperature. We will set up a bird formed with urethane foam on the roof. Usually it does not install by stabbing an object because it affects the waterproof layer, but since the building itself is a waterproof layer, such humorous decoration is possible. Invited by an object, the birds should come down. This building has a form far removed from the general concept of beauty. But what does the soft and warm environment that this building brings mean? Architects may need to leave common sense beauty and concept once. I think that it is necessary to redefine a pleasant environment as a living thing and to draw out concepts and beauty of orders along that. 2：It is necessary to add functionalities such as termite resistance, biodegradability and fire resistance to the material. Fire resistant urethane foam is on the market and cost is a bottleneck. 3：There are some issues on how to varify the structural analysis,and how to guarantee the safety.